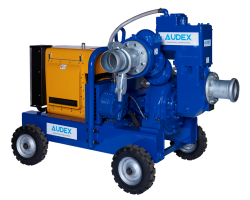 Audex are respected manufacturers of industrial submersible and vac-prime self-priming dewatering pumps. Our pumps have been specifically developed for use in the toughest and most abrasive of applications and environments. Trusted by operators of quarries, mines and recycling facilities, Audex pumps represent quality and reliability giving you superior performance and reduced downtime. Pumps that suit your application better because they have been designed with your industry in mind. Audex pumps are available in a range of sizes from 2” to 10” discharge, these robust pumps feature heavy-duty cast bodies, oversize shaft and bearings, hardened impellers and nitrile-lined diffusers and wear plates to maximize wear life when pumping abrasive liquids. Polyurethane lined diffuser and wear plates are available for extreme wear applications and the pumps are available in high head and stainless steel variants. The submersible range of pumps are available with a seal fail detector system which monitors moisture levels and shuts down the pump in the event of seal wear or failure. This avoids costly rewinds and allows for a quick parts replacement without a costly full pump rebuild. Audex pumps also allow you to adjust the diffusor to compensate for wear. Audex also manufacture a range of pontoons to mount our pumps on when installing in a lagoon, and discharge units to monitor site discharge. All this adds to up to increased pump life and less pump related down-time even in the most stringent environments. Audex Pumps – designed with your industry in mind.